One of the things I love to do with this blog is to use my science background (I have an M. Ed in science education and used to be a middle and high school science teacher) to create new play recipes that are safe - and if possible, that are edible (I love the idea of creating sensory play that is great for all ages so that babies and toddlers can join their siblings in play without having to miss out on the fun). So far I've developed a Safe/Edible Glow Water, and Edible Mini Water Beads (with no choking hazard! ), and an Edible Pretend (Melting!) Ice Cream Dough. We love to play with slime and gak around here and one of my toughest recipes to develop was this one - a totally edible and chemical/borax free slime. It's no cook, super easy, and takes less than five minutes from start to finish! I'm super proud of it (and spent many hours experimenting in our kitchen to get here) and I hope you all love it as much as we do! Like any great slime it's suuuuper stretchy! You can grab it with two hands and just pick it right up off a table. It feels so soft and slightly cool (in that way that slime always does)...sometimes you just gotta wrap your entire forearm in it. For the first time ever, X was able to touch our slime (here he's just over a year - at that age I still didn't trust him not to taste, so he had to sit out during former slime plays). He had a great time poking it with his fingers then slowwwwly lifting them up and watching the slime fall over and over. Measure 1/4 cup of basil seeds into a bowl and add one full 16oz box of cornstarch (cornflour). Mix them together (kid hands are really good at this part). Add food coloring (if desired) to 2.5 cups of water. Add the water to your cornstarch and seed mixture and stir well. I find that it's easiest to do this part with my hands. You will ultimately end up kneading the slime like bread dough as over the span of 5 minutes, the seeds will begin to absorb the water and it will begin to thicken the mixture. If you find any clumps of seeds while kneading, break them up with your fingers. Once the slime is completely uniform feeling - you're good to go! When you're done playing with your slime, store it in a sealed container in the refrigerator. Ours lasted for a little over a week. You may find that you need to knead your Edible Slime briefly before play each time to break up any clumps that may have formed. UPDATE: We have created a new slime recipe for those of you who can't find Basil Seeds where you live. The new slime will work with chia or flax seeds and if all else fails can be made seedless as well. 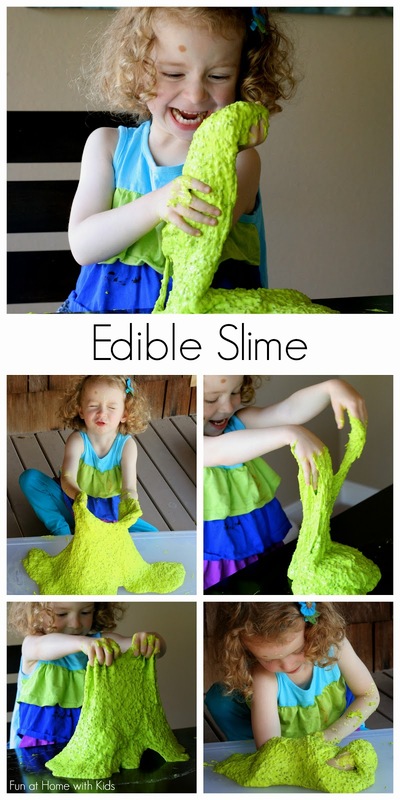 Click here if you need an alternate No-Cook Edible Slime recipe. Asia I love this, it looks like great fun and super that babies can enjoy it too. YAY! Thank you, Emma! It's really SOOOO cool. I played with it just as much as them. I also was super proud and made my husband and my parents play with it, hahahahha. ASSSIA-- You did it again!!!! Looks amazing and the color.. ahhhh so fun. I was hoping to see this float around later during the day.. but imagine my surprise to see this super amazing post ...Great work and perfect color choice. Thanks for persisting with your experiments :) Will be giving this a try on the weekend - it looks like so much fun! We'll have to use chia seeds though, no basil seeds to be found here not til later in the season. I love these non toxic plays that you are adding lately! I am always avoiding playing with things because of the chemicals and now we can play. thank you!! Love this! You are so clever. You are revolutionary and amazing, Momma!!!! You are so sweet, Devany!!!! Thank you!!!! This is awesome!!! I've got to get me some basil seeds to play with!! I pinned this to my (CarlaINHouston) Kid's Science board and shared it on my PreschoolPowolPackets Facebook page--I think it's just brilliant! Love this! Thank you for sharing! I just made Gak last week for letter G sensory tub...wish I had this recipe! I shared a link to your recipe on my blog! I love that you are creating safe, natural and edible sensory recipes! Oh my word, GroovyEm! That is so horrifying to contemplate! This one rinses off with water and most assuredly does not harm tables (or children). Phew!!! Have you tried it with flax? Yep. And flax, while gooey when soaked in water, was not gooey enough to hold it together. Boo. Thank you, Kate! I like the more practice theory, hahaha! It's pretty crazy. Gotta love science. And please do try it - I hope you guys love it as much as we do. Will any basil seed work or just hairy basil? I love these edible recipes! With an almost toddler who has to do everything her brother does it is rough when the recipes are not safe. Thank you! Any basil seed will work - however hairy basil is the one that is typically offered as food. You could use the seeds in the seed packets if your kiddos aren't going to taste them, I just worry that planting grade seeds might not be up to the same standards as food grade seeds, if that makes sense. But all basil seeds do this - cool, right? This looks amazing. You are right don't use planting grade seeds. They often have chemicals on them to stop the going mouldy and rotting while they are being stored. AWESOME!!!! I'm so glad you made it and love it! I could not get over how much it felt like storebought slime. So much fun! Yay!!!!! The chia seeds are not quite dissolved yet, so I will see how in 8hrs time! Does it come off clothing and floors? Yep and yep. If you let it dry it will flake off, or you can wipe it up with a damp paper towel. We had no issues with it. Just remember not to wash it down the sink or it will clog your pipes! I just made this with my daughter and it's absolutely amazing! Thank you so much, your blog is always so inspiring! I've just prepared the chia seed recipe (since we had some in the house) for the children i nanny for and even before I placed it in the fridge the kids and I were having a ball with it! A very calming and stimulating activity. We've made oobleck (a.k.a. goop) before many times but the kids have grown bored with it. This slimy twist is just was they needed for a cold, snowy day :) Thank you for sharing! I want to make this for my toddler class. But Im thinking of using oatmeal instead of basil seeds to absorb the water. ¡Oh, no, lo siento mucho! Me gustaría poder ayudar. ¿Hay tiendas en Perú que venden especias internacionales? Semillas de albahaca se usan como una especia o en las bebidas en las comidas asiáticas. Stumbled across your site by accident......I must say its fantastic. So many sensory play ideas. I've shared with our 4000 Facebook fans. Keep up the good work. Thank you so much, Andrew!!!! It should hold - but it does make it inedible. If you're just going for a chemical-free slime, I'd say go for it!!! Can you store it for play at a later time? If so, for how long and in what type of container? Just wondering if it will work if you put the seeds in a blender or food processor (or maybe even a coffee grinder) and process until they are a powder...then continue as your recipe instructs. Also an ascorbic acid (vitamin c) tablet or two would help as a preservative and give it a longer play-time life. I mean, I don't know about anyone else but at $8 a bag for the seeds....this is really pretty pricey for slime. I'm not sure if that would work or not (food processing). It may...though I suspect you'll get the best slime with the full seeds as they would add more stability. Great idea with the vitamin C! And yes, if you buy online, the bag is pretty pricey (it's around $1 a bag at our local store), but it also lasts for quite a long time - so it will make several batches of slime. Can you show me a picture of what the bag of hairy seeds looks like? I tried sprouts here but they don't know what I'm talking about. I called one Asian supermarket and they said they have basil seed but didn't know what hairy basil seeds were. Do you have a business email I can contact you with? I just bought your book and I'm sure I'll have more questions! Water is a chemical. Cornstarch and seeds are compromised of many chemicals. Please stop proliferating the idea that all "chemicals" are bad. The title of this post made me seriously doubt your credentials. I title my posts for SEO. Sorry to have offended you! I was so excited to try this and even purchased the seeds through your link. Followed directions carefully and ended up with basically a big bowl of green water! Any idea where I mightve gone wrong because I cannot figure it out! SO weird! Can you send me a photo at funathomewithkids@gmail.com? I can help you figure out what happened if I can see what it looks like. So sorry! Same exact thing happened to me today! Tried adding more basil seeds, no improvement. Any ideas? can you use a substitute for the seeds, like oatmeal or something else..? If you click on the link at the end of the post, it will take you to a post with three alternatives, including seedless. And no I've never gotten oatmeal to work, sorry! We just tried this and big fat flop! We have attempted the basil seed slime and although the seeds absorbed the water they arent sticking together and are still separate? Do I need to add more corn flour for it to become slime? Hmmm. I'm not sure what happened. Can you send me a photo at funathomewithkids@gmail.com? I can usually solve it if I can see a photo (and a phone photo is totally fine). Can you use tapioca starch instead of cornstarch? Wondering for those with allergies to corn. Oh I do -- I know that's annoying, but I have to title based on search terms if I want people to find the posts. People looking for "safe" slimes use the term "chemical free slimes" so that is why it's called that and includes that term in the title/post. I used a bunch of expired chia seed instead of basil seed and it worked! Also added a bit of baby oil to keep it moist for longer and give some scent. Thanx for the idea! I was so excited to try this DIY project.